We had fun with two other families at Splash Country on Sunday. It was a hot day and the water was cold, so it was perfect. Laura had a blast. My favorite memory of this day is when Laura and I were going down a small slide together side by side. Jim was at the bottom supposedly catching her when she hit the water. Well, he thought I had her back and she just went right under the water. She was a bit shocked, to say the least, but she recovered well. On a side note, potty training is still in session. It's been frustrating at times, and I feel like it might take forever!!! Our next strategy is to stay home for a couple days with no outings. It's been a work in progress that is for sure! Sounds like a fun day. Being in the water is such a fun thing to do as a family. We are potty training as well. Isn't it so fun(note sarcasm here)? It is the hardest parenting thing we have done. Sounds like fun! 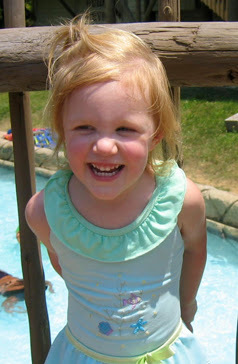 I am talking about the splash country - NOT potty training! Hope the frustrations end soon. Hang in there - IT will happen. It will just be in "Laura" time! It sure was a fun day, Sara! Watching the girls together was a blast. Mackenzie truly loves the water. Me, too! And watching from the sidelines...Laura going under and the shock on all THREE of your faces was comical. (That is, after we knew she was ok!) I was just as shocked watching it all transpire, but with such a quick and smooth recovery, it became hilarious just as quickly as it all happened.